Unleash the power behind the armor. $174.144 million on 4253 screens. Back in 2008, Iron Man became a major hit, and 2010’s Iron Man 2 matched up with it – financially, at least. Both films enjoyed nearly identical US grosses around $315 million, and total worldwide takes were pretty similar as well. However, the two movies enjoyed rather different critical receptions. While the 2008 flick earned consistently strong reviews, its first sequel confronted a much more mixed bag of viewpoints, and fans seemed less enchanted by it as well. Iron Man 2 became seen as a disappointment – not a dud, but a letdown after the highs provided by the original film. Between Iron Man 2 and 2013’s Iron Man 3, 2012’s The Avengers happened – and turned into the most successful superhero movie of all-time. That probably added to expectations for Iron Man 3, a film that could make or break the franchise. 3 leaves the series in better shape than ever. No, it didn’t even remotely approach the insane $623 million of Avengers, a flick that clocked in at a cool $1.5 billion worldwide. Nonetheless, 3’s $408 million US easily placed it above its two predecessors, and its $1.2 billion worldwide allowed it to become a genuine phenomenon. Financially, that is – how about creatively? Would 3 offer fun in the vein of the first film or erratic thrills akin to its first sequel? Happily, it’s more the former, as 3 delivers a pretty good return to form after the disappointing 2. In the aftermath of the near-end-of-the-world Avengers events, Tony “Iron Man” Stark (Robert Downey, Jr.) finds it hard to don the armor with the same abandon as in the past. Following a near-death experience, he suffers from a form of PTSD and this saps his ability to act play the hero – and to sleep. With restless nights at his disposal, Tony works obsessively on new Iron Man technology but threatens to crack under the strain despite the best efforts of executive partner/girlfriend Pepper Potts (Gwyneth Paltrow) to keep him grounded. Into Stark’s stressful life steps a new villain: a terrorist who calls himself the Mandarin (Ben Kingsley). He stages violent attacks against American interests and eventually comes after Stark himself. Left with reduced resources, Stark must find a way to get past his inner demons and deal with this threat. After the disappointment of Iron Man 2, I felt a bit leery about 3. Add to that I was one of the approximately 38 fans who didn’t love Avengers and I went into the newest Iron Man adventure without the highest of hopes. Nothing I find in 3 changes my mind about the franchise, as I just don’t think I’m ever going to really embrace it. I liked the first flick and Avengers but didn’t see them on the same level as the strongest genre efforts like the Raimi Spider-Man flicks or the Nolan Batman efforts. Again, 3 doesn’t alter that, but I do think it delivers a pretty enjoyable superhero adventure. It’s clearly a massive step up from 2 and probably tops the first film as well; I might not put it in the upper echelon of its genre, but it brings us solid entertainment. Probably the area in which 3 demonstrates the most welcome change from 2 comes from its tone. Perhaps as a contrast to the seriousness of Dark Knight, 2 decided to go light – really, really light. Even with a mix of dramatic subjects at its core, the film emphasized comedy and silliness. While I don’t think the Iron Man franchise should go as dark as the Nolan Batman flicks, I’d like something weightier than what we got in 2, and 3 manages a nice balance. Given its discussion of terrorism and psychological problems, it definitely leans toward a certain level of drama, but it still comes with enough comedy to feel like part of the franchise, and it manages to avoid gratuitous laughs. Heck, 3 even manages a particularly difficult feat when it introduces Harley Keener (Ty Simpkins) as a young sidekick to Tony. The potential for saccharine “bonding” goes through the roof when this occurs, but 3 maintains enough snark and edge to prevent goopy melodrama. It also keeps us interested during the long stretches in which Iron Man doesn’t appear. When I reviewed 2, I complained that we had to wait forever for any Iron Man action. As it happens, 3 takes even longer before it gives us much from its title character, but it doesn’t feel that way. I guess my problem with 2 wasn’t that we waited so long for Iron Man; my issue was that the film gave us little to entertain us until the title hero’s first action. 3 doesn’t come with the same concerns; even though Iron Man doesn’t do much until well into the first act, the story/character elements we find easily occupy our attention. Of course, the solid cast continues to benefit the series. Now in his fourth film as Tony/Iron Man, Downey shows no signs of boredom with the part, and he seems to enjoy the expansion of the Stark role; 3 allows new shades to the character and helps keep things fresh. Pearce does well, too, and the addition of Kingsley adds tremendous value to the film – especially when we find a massive character twist. I won’t say much about that curveball because I want to avoid spoilers, but it does come out of nowhere – and it’s a complete winner, particularly due to the gusto with which Kingsley plays the part. Some fans don’t like the film’s depiction of the Mandarin, but I’m completely on board with it, probably because Kingsley brings such verve to the role. With better action, a more compelling villain and a tighter narrative, Iron Man 3 delivers a big step up from 2. I doubt the franchise will ever become a favorite of mine, but I think 3 gives us a pretty strong action adventure experience. Footnote: as always, stick around through the end of the credits for a little bonus clip. 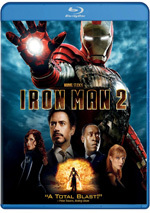 Iron Man 3 appears in an aspect ratio of approximately 2.40:1 on this Blu-ray Disc. I expected a brand-new big-budget flick like this to look great, and Iron Man 3 did. Overall definition worked well. If any softness materialized, it escaped me, as I found an image with tight, accurate delineation. I saw no shimmering or jagged edges, and the image lacked edge haloes or print flaws. Like many modern action flicks, Iron Man 3 opted for a fairly teal palette; it also leaned toward an amber tone at times. I would’ve liked something that deviated from the norm, but I didn’t think the teal approached the obnoxious levels of something like A Good Day to Die Hard, so the hues seemed positive. Blacks were deep and dark, while shadows showed nice clarity and smoothness. Across the board, the movie looked terrific. I also felt consistently pleased with the excellent DTS-HD MA 7.1 soundtrack of Iron Man 3. With tons of action, the soundscape used all the channels on a frequent basis. This led us to an exciting sonic experience from start to finish. The various speakers provided lots of information that filled out the movie and blended together in a seamless manner. Bullets, explosions, vehicles – you name it and it blasted all around us. This formed a dynamic soundscape with a lot to offer. In addition, audio quality seemed strong. Music was bold and full, and even with a lot of looped lines, dialogue remained crisp and natural. Effects appeared lively and vivid, with clear highs and deep lows. I felt pleased with this impressive soundtrack. When we look at extras, we begin with an audio commentary from director Shane Black and screenwriter Drew Pearce. Both sit together for a running, screen-specific look at story/character/script areas, cast and performances, sets and locations, effects and action, editing and alternate sequences, and other areas. Despite a few minor gaps, Black and Pearson deliver a highly entertaining and informative take on the film. As one might expect, story/character areas dominate, and those provide lots of good tidbits about various drafts of the script and different changes. Heck, we even get a fascinating sidebar about how Die Hard connects to the Odysseus myth! Fun, illuminating and peppy, this becomes a strong commentary. A continuation of a series found on other Avengers-related discs, Marvel One-Shot: Agent Carter runs 15 minutes, 29 seconds and focuses on events connected to Captain America. Set after Cap’s disappearance, Hayley Atwell reprises her role as his girlfriend in this moderately compelling little adventure. Under “Featurettes”, we find three pieces. Iron Man 3 Unmasked lasts 10 minutes, 59 seconds and offers notes from Black, producer Kevin Feige, stunt coordinator Markos Rounthwaite, visual effects supervisor Christopher Townsend, executive producers Stephen Broussard, Louis D’Esposito and Victoria Alonso, production designer Bill Brzeski, associate producer Mitch Bell, stunt double Trevor Habberstad, and actors Robert Downey, Jr., Gwyneth Paltrow, Stephanie Szostak, James Badge Dale, Don Cheadle, and Guy Pearce. The piece covers the Iron Man suits and related elements, stunts and action, sets and locations, story/character areas, various effects, and other production challenges. Essentially it tries to run through the whole movie in 11 minutes, and it bites off much more than it go chew. While we find some good material, it flies by too quickly and leaves this as a somewhat unsatisfying show. Deconstructing the Scene: Attack on Air Force One goes for eight minutes, 43 seconds and features Feige, D’Esposito, Broussard, Alonso, Townsend, stunt coordinator Jeff Habberstad, 2nd unit stunt coordinator Jim Churchman, production supervisor Jason Tamez, visual effects producer Mark Soper, senior animation supervisor Erik Gamache, and compositing supervisor Michael Maloney. As expected, this piece looks at the elements that went into one of the movie’s big action sequences. Though a little on the short side, it still delves into the subject matter pretty well as it lets us see the components required for the aerial scene. Finally, we locate an Exclusive Behind the Scenes Look at Thor: The Dark World. In this one-minute, 53-second clip, we hear from Feige, director Alan Taylor, and actors Chris Hemsworth, Natalie Portman, and Tom Hiddleston. This is nothing more than an ad for the next Thor movie; don’t expect to learn anything from it. 10 Deleted and Extended Scenes occupy a total of 16 minutes, 20 seconds. These include longer segments from the Bill Maher and Joan Rivers TV shows, and we also get a fair number of alternate lines/outtakes. The most significant addition comes from material with the bully who pesters Tony’s young pal Harley; those scenes provide an unused subplot with some action. While the bully segments have some meat to them, the rest of the footage is interesting but pretty insubstantial. A Gag Reel fills five minutes, seven seconds. It shows the standard collection of goofs and giggles. I’ve seen better, but I’ve also seen worse. The disc opens with ads for Thor: The Dark World, Agents of SHIELD, the Lego Marvel Super Heroes game, The Lone Ranger and Iron Man/Hulk: Heroes United. 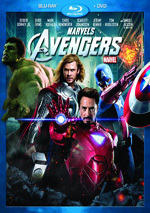 Under Sneak Peeks, we also get promos for Audi, Marvel’s Avengers Assemble and Hulk and the Agents of SMASH. No trailer for Iron Man 3 appears here. 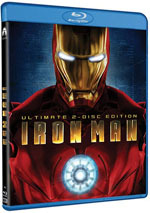 A second disc provides a DVD copy of Iron Man 3. My review copy of the Blu-ray didn’t come with this extra platter, so I can’t comment on its contents. After the disappointing Iron Man 2, the franchise rebounds with the fun, exciting Iron Man 3. 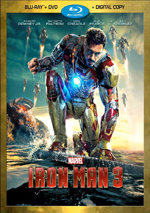 Buoyed by a higher level of drama and the addition of Ben Kingsley to the cast, 3 might be the best of the Iron Man films to date. The Blu-ray boasts excellent picture and audio along with bonus materials highlighted by a delightful audio commentary. Fans will be happy with this solid release.